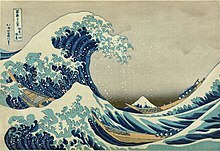 Katsushika Hokusai (葛飾北斎, Katsushika Hokusai, October 1760–May 10, 1849), also called Hokusai, was a Japanese artist. He was a master of the ukiyo-e style of woodblock prints and painting. The artist is best known for The Great Wave off Kanagawa, which is a woodblock print. This page was last changed on 9 December 2017, at 02:07.